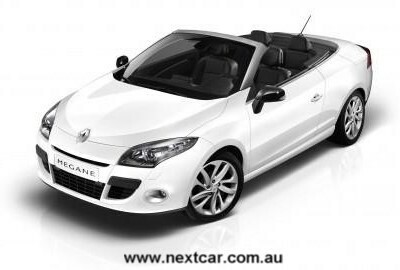 The new Renault Megane Coupe-Cabriolet completes the renewal of the Megane 'family'. This now comprises six body types, the successive launches of which have seen Renault rejuvenate its range in the space of just one and a half years in what is Europe's biggest segment in terms of volume. The Megane line-up held third place in its segment in Europe at the end of 2009, and enjoyed the number one position in France. With sales totalling over 170,000 since the launch of the first-generation version, Megane Coupé-Cabriolet accounts for four per cent of the Megane family mix and, in 2009, continued to represent one sale in 10 in western Europe's compact cabriolet segment. 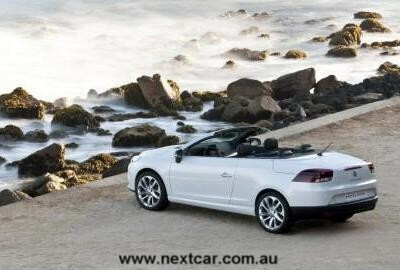 The new Renault Megane Coupe-Cabriolet builds on the strengths that helped forge the success of its predecessor. It brings head-turning looks, plus a genuine sense of freedom thanks to its panoramic glass roof and the forward position of its windscreen. Its standard fixed glass wind deflector reduces turbulence to maximise the pleasure of 'al fresco' motoring. New Renault Megane Coupe-Cabriolet is made at Renault's Douai plant, in northern France, alongside Scenic and Grand Scenic. It consequently benefits from the significant production expertise gained by this factory since the launch of the first Mégane Cabriolet in 1997. New Renault Megane Coupe-Cabriolet is an open invitation to enjoy open-top motoring, and is an elegant illustration of Renault's new brand signature, 'Drive the Change'. 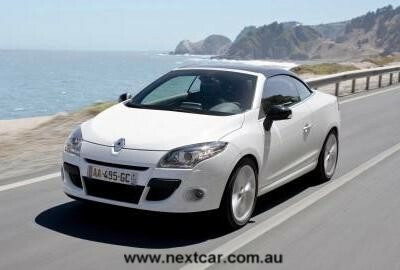 New Renault Megane Coupe-Cabriolet is now on sale in western Europe. Like that of its predecessors, the design of the Megane family’s latest addition, new Renault Megane Coupe-Cabriolet, has been styled to attract attention. Thanks to its graceful lines and high-gloss finish tinted black glass roof, the car exudes elegance and a distinctive style. Thanks to new Megane Coupé-Cabriolet's length (4,485 mm, an increase of 130 mm over its predecessor) and wheelbase (2,609 mm, +87 mm), the newcomer's silhouette is both sleek and chic. The front-end sports the new Megane family's hallmark sweeping feature line across the bonnet and the same bumper as the Coupé version, while the redesigned boot-lid incorporates the upper part of the new rear light clusters. The two LED tail-light patterns provide a smart and instantly recognisable rear lighting signature for new Megane Coupé-Cabriolet. 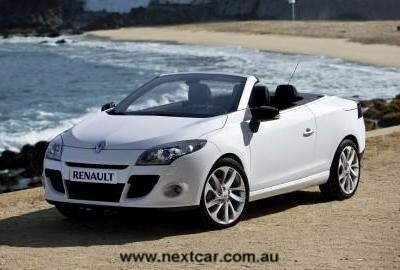 In today's competitive landscape, new Renault Megane Coupé-Cabriolet stands out through its large folding glass roof. Widely acclaimed by Mégane II Coupé-Cabriolet owners for the generous amount of light it lets into the cabin with the top up, as well as for the visibility it affords, this roof is not only standard equipment for the latest-generation car, but also 10 per cent bigger. It is now the segment’s largest folding glass roof, with a total glazed area amounting to almost one square metre (0.47m2 for the actual roof section and 0.5 m2 for the rear window). The combination of its dark tint, gloss black pillars and satin-effect chrome windscreen frame and waistline exude a high-end feel that tell you this is a cabriolet, even with the top up. This glass roof acts as a symbolic link between the coupé and cabriolet functions. Even with the top raised, it floods the cabin with light, giving the driver and passengers a genuine feeling of space and freedom. Seven body colours are available, including Pearlescent White. Elegant details prevail inside the cabin, too, thanks to a blend of soft forms, sweeping lines, an outstanding standard of finish and the use of high-quality materials. The interior resembles that of the other Mégane family body types and comes with the same wave-like dashboard as new Mégane Hatchback and Coupé. Two trendy, understated interior trims (dark charcoal and light beige) are available, as well as a two-tonered/dark charcoal leather upholstery for those who desire an even more striking, classy ambience. The large glass roof gives new Megane Coupé-Cabriolet's occupants an enjoyable 'open-air' experience, even when the top is raised. With the roof lowered, the driver and passengers alike benefit from the pleasure of open-air motoring even more than before thanks to the more advanced position of the windscreen header-rail which has been moved forward by 6 cm compared with its predecessor. This also gives easier access to the front seats and eliminates the 'cap' effect of longer, more steeply raked windscreens. The standard fixed glass wind deflector is unique in the segment and reduces wind noise and turbulence at up to 90 km/h with four occupants in the vehicle. With just two people aboard, an additional mesh deflector screen can be clipped into place over the back seats. The combination of the fixed glass wind deflector and mesh screen offers smooth, unruffled motoring enjoyment at all speeds. The driver and passengers alike consequently get to enjoy all the thrills of 'al fresco' motoring, without the drawbacks. - a hydraulic system equipped with an electronic control unit. To optimise the passage of light into the cabin, the tempered-glass roof has been treated to filter sunlight with a coefficient of 35. A sunblind incorporated in the rear cross beam offers additional protection if required, while the heater rear window provides coupé-like functionality. Compared with a soft top, the folding glass roof provides a level of thermal and acoustic comfort worthy of a saloon car, as well as greater protection against vandalism. The solid roof also increases resale value. Meanwhile, the roof's folding mechanisms have been reinforced to guarantee an optimal watertight seal throughout the life of the vehicle due to an increased number and size of connecting rods. The total weight of the module is 110 kg (75 kg for the roof, and 25 kg for the folding boot-lid mechanism). Roof systems are completely manufactured and assembled by Karmann® in Germany and delivered to the Renault plant in Douai ready to be installed. The opening and closing of the two-part roof is controlled by a fully-powered, electro-hydraulic mechanism. By holding down a button within easy reach on the console, the driver can lower the top in just 21 seconds. For the mechanism to operate safely, the boot divider must be installed and the boot-lid closed. A dashboard message warns the driver if either requirement has been overlooked. An audible signal and a dashboard message tell the driver when the roof has been safely stowed away. A second press on the same button or a single touch on the 'Grand Air' switch on the driver’s door lowers all four windows simultaneously. A new feature compared with Mégane II Coupé-Cabriolet is the 'short drop' function which raises the windows several millimetres into the roof module and windscreen pillar seals to optimise protection against noise and water. New Renault Mégane Coupé-Cabriolet's occupants feel protected, comfortable and free. Entry to both the front and rear seats is very simple. A position memory function makes life even easier for the driver and front passenger by returning the respective seats back to their original position once the rear passengers have boarded. Front occupants enjoy a class-leading 1,466 mm of elbow room. Rear passengers benefit from additional reclining backrest angle and an extra centimetre of kneeroom compared with Mégane II Coupé-Cabriolet. - centre console and seats designed to facilitate the easy fastening of seat belts. Comfortably installed in the ideal driving position, drivers can remain focused on the road. Designed to carry four people and their luggage, the new Renault Megane Coupé-Cabriolet offers a conventionally proportioned, easy-to-access boot. The boot compartment is generously sized for the category: 417dm3 in the coupé configuration and 211dm3 as a cabriolet. The sill height is 590 mm, the segment’s lowest, to make loading and unloading particularly easy. With the roof stashed away, the best-in-class height of 258 mm available beneath the boot divider enables three cabin cases to be carried side by side. New since Mégane II Coupé-Cabriolet, the boot features a motorised closing system (power lock), for effortless locking. The nine-litre glovebox locks and unlocks at the same time as the doors. Personal items are kept safely out of sight when the vehicle is parked. - customised settings and activation/deactivation of certain functions (daytime running lights, volume of audible parking proximity warning). Developed in association with Arkamys®, a specialist in digital sound processing for the cinema, the 3D Sound by Arkamys® audio range offers superior, spatialised sound reproduction by taking into account the materials and forms of each vehicle cabin. The sound can also be configured to match the number of people on board and where they are seated. - two dedicated aerials for optimal audio reception. - the new TomTom IQ Routes application uses the journey data of road-users to compute and suggest the quickest route based on real-world driving speeds, and not just speed limits. - a range of customisation options. The new Renault Megane Coupe-Cabriolet's precise, reassuring handling and outstanding acoustic comfort all contribute to the exceptional driving pleasure it delivers. The coupé-cabriolet version is based on the same technical specification as the other models that make up the new Mégane range, but packs a number of specific features aimed at enhancing the pleasure associated with top-down motoring, with efficiency and comfort as overriding watchwords. The front suspension is based on a MacPherson-type arrangement associated with the new 'horned' subframe. This layout is engineered to deliver impeccable steering precision by restricting lateral movement of the engine subframe in relation to the body structure (three times more rigid than the previous-generation car). The rear suspension incorporates a programmed-deflection flexible beam, with a closed-section beam that is both lighter and more compact than a multi-arm solution for equivalent torsional stiffness. To further optimise the balance between directional precision and comfort, new Renault Mégane Coupé-Cabriolet's rear suspension mountings employ bi-material bushes which permit different hardnesses of rubber to be used for the filtering and transverse rigidity. The chassis has been tuned to ensure a high standard of ride comfort and match the specific weight distribution associated with hard-top coupé-cabriolets. - the dampers have been stiffened for first-class body roll performance. At the same time, the hardness of the bump stops has been reduced in the interest of comfort, while the ratio between the spring stiffness and the car's sprung weight is equivalent to that of new Megane Hatchback. The specific roll angle – which refers to the angle by which a vehicle 'leans' when cornering, and therefore its capacity to corner 'flat' – is 0.41°/ms-2, compared with 0.48°/ms-2 in the case of Mégane II Coupé-Cabriolet. The new Renault Mégane Coupé-Cabriolet combines a particularly comfortable ride with exceptional cornering precision. To combat vibrations and ensure a level of torsional rigidity comparable with that of a coupé (which obviously benefits from a closed-cabin architecture), the new Renault Mégane Coupé-Cabriolet comes with bespoke structural strengthening. This work has resulted in static and dynamic torsional stiffness being improved by 80 per cent and 30 per cent respectively over Mégane II Coupé-Cabriolet. - and the steering ratio has been changed from 18:1 to 17:1 in the case of the new-generation version. The system's calibration has also been modified to deliver greater driving comfort and a more natural feeling with regard to the feedback of information from the road. The new Renault Mégane Coupe-Cabriolet benefits from powerful brakes, too, thanks to 280 mm-diameter ventilated front discs (296 mm in the case of versions powered by the dCi 160 engine) and 260 mm-diameter solid discs at the rear. The New Renault Megane Coupe-Cabriolet line-up includes a wide choice of responsive engines and new automatic transmissions which are simple and fun to use for even greater driving pleasure. New Renault Megane Coupe-Cabriolet can be ordered with one of up to three petrol engines (depending on market): the 1.6 16V, the 2.0 16V or the turbocharged 1.4 TCe 130 (TCe: Turbo Control efficiency). The 1.6 16V 110 hp and 2.0 16V 140 hp powerplants are both acclaimed for the driving pleasure afforded by their punchy performance, easy pick-up from low revs and sprightly response at higher engine speeds. A bioethanol E85 version of this engine is also available. The 1.6 16V engine boasts maximum power of 81 kW (110 hp) at 6,000 rpm and peak torque of 151 Nm at 4,250rpm. It is matched to a manual six-speed manual gearbox. The 2.0 16V engine claims peak power of 103 kW (140 hp) at 6,000 rpm and maximum torque of 195 Nm from as low as 3,750 rpm. It drives through the Renault-Nissan Alliance-developed CVT (Continuously Variable Transmission) seen for the first time in the new Megane range. CVT (Continuously Variable Transmission) does away with conventional gear changes to provide smooth, seamless performance for a free-flowing driving style. In the case of a conventional automatic transmission, the ability to adapt the point on the engine's operating curve to the demand for power is restricted by the number of available gears. The continuous variation of the CVT allows the point on the engine's operating curve to be optimised, even during transient phases, the aim being to provide continuous variation of several gear ratios by simultaneously adjusting the diameter of the primary and secondary pulleys which are linked by a steel belt. CVT consequently permits continual variation of a number of ratios in order to optimise the point on the engine's operating curve (engine speed and throttle) from the fuel consumption, emissions and acoustic comfort points of view. Thanks to the work of the Alliance's engineers, Renault's CVT figures among the best in its class with regard to its seamless acceleration performance. The new TCe 130 engine benefits directly from the work carried out by the Alliance in the field of downsizing. It boasts the power of a 1.8 litre engine (130 hp/96 kW) and the torque of a 2.0 litre block (190 Nm), yet its cubic capacity is just 1,397 cc, resulting in combined-cycle fuel consumption of just 7.3 litres/100 km. The TCe 130 drives through a six-speed manual gearbox. The new Renault Megane Coupe-Cabriolet is available with a choice of three latest-generation Euro5-compliant diesel engines: dCi 110 DPF, dCi 130 DPF and dCi 160 DPF. The dCi 110 DPF delivers feisty performance from low revs thanks notably to careful work on combustion efficiency (five-injection cycle) and to its specific turbocharger management. Maximum torque is 240 Nm at 1,750 rpm. The dCi 110 DPF can be ordered with a six-speed manual gearbox or with the new six-speed EDC (Efficient Dual Clutch) automatic transmission (see separate description). The new six-speed EDC (Efficient Dual Clutch) automatic transmission is an clear illustration of Renault's determination to combine ride comfort, driving pleasure and respect for the environment. Matched to the dCi 110 DPF engine, it permits CO2 emissions of just 130 g/km and combined-cycle fuel consumption of 5 litres/100 km, figures that are equivalent to the same engine with a manual gearbox. As a consequence, the new Renault Mégane Coupé-Cabriolet dCi 110 DPF qualifies for the Renault eco² signature. The dCi 130 DPF engine benefits from extensive fine-tuning work on the 1.9 litre diesel block. Features include a new turbo with curved blades and seven-hole injectors which enable this engine to combine powerful performance with fuel efficiency. Maximum power is 96 kW (130 hp) at 3,750 rpm, while peak torque is 300 Nm at 1,750 rpm. Meanwhile, work on the engine mounts has produced significant gains in terms of acoustic performance. The dCi 130 DPF is coupled to a six-speed manual gearbox. The dCi 160 DPF engine is derived from the Alliance's 2.0 litre diesel block and stands out as the most powerful and 'torquiest' four-cylinder diesel engine with the highest power and torque output in the Megane range. Thanks to its variable-geometry turbo and carefully engineered intake aerodynamics, this engine is particularly responsive, with peak torque (380 Nm) available from as low as 2,000 rpm. The dCi 160 DPF engine revs freely and smoothly up to 5,000 rpm and drives through a six-speed manual gearbox. Renault's new EDC automatic dual clutch transmission dispenses with the need for a clutch pedal, while gearshift control is of the 'P-R-N-D' type, plus an 'up/down' shift mode. In automatic mode, the electronic control unit takes onboard a number of parameters to select the ideal gear. The system adapts instantaneously to the driver's demands by selecting the gear that delivers just the right amount of power the instant it is required. The driver is free to take control of the system thanks to the 'up/down' shift mode. As with any automatic transmission, gearshifts are carried out under load. When one gear is engaged, the next is automatically pre-selected. The gearshift takes place by switching from one clutch to the other: the first clutch disengages at the same time as the second engages, ensuring that power delivery is not interrupted during the shift. The first of the two clutches looks after the odd-number gears (1st, 3rd and 5th), while the second covers the even-number gears (2nd, 4th and 6th), as well as reverse. Renault has chosen a dual dry clutch system to minimise friction which has led to appreciable fuel consumption savings and CO2 emissions gains compared with a conventional automatic transmission. Thanks to its ultrafast shift time (290 ms), the new EDC automatic dual clutch transmission is extremely responsive. Gear changes are smooth and free of jarring to ensure a reassuringly smooth ride. Driving comfort is further enhanced by the optimised 'creep' control: when starting, the vehicle pulls away gradually when the brake pedal is released. This feature is particularly welcome in stop/start traffic or when parking. The system also incorporates a hill-start assist function: when starting on a slope, pressure continues to be applied to the brakes when the driver lifts off the pedal, thereby keeping the vehicle stationary for a few seconds. Coupled with the creep control function, this prevents rearward movement of the vehicle to ensure safe hill starts. - its fuel consumption and CO2 emissions, which are comparable with those of a manual gearbox. Thanks to the work of Renault's engineers, fuel consumption is 17 per cent lower and CO2 emissions have been reduced by 30 g/km compared with a conventional automatic transmission. Coupled to the dCi 110 DPF engine, and thanks to CO2 emissions of 130 g/km, EDC transmission is the first automatic transmission to qualify for the Renault eco² signature. Safety is a strategic priority for Renault, and the brand benefits from both its long standing engineering expertise in this area and the results of the work carried out by LAB* to develop the most effective safety systems for real-world driving situations. The new Renault Megane Coupe-Cabriolet benefits extensively from Renault's acclaimed expertise in the fields of active and passive safety. - ESC with understeer control. In terms of its passive safety performance, new Renault Mégane Coupé-Cabriolet benefits from the acclaimed front- and side-impact energy-absorbing ability of the new Mégane's carefully engineered platform, and from the specific strengthening of zones exposed to particularly high constraints (the bottom part of the engine compartment, windscreen pillars and sills, as well as side-impact protection built into the foot of the B-pillar). Like the new Renault Mégane Hatchback, new Renault Mégane Coupé-Cabriolet's programmed deformation structure incorporates high and very high elastic limit steels to optimise the absorption and dissipation of kinetic energy in an accident with a view to protecting the cabin, and therefore its occupants. Meanwhile, the new Renault Mégane Coupé-Cabriolet's specific architecture has called for specific passive safety solutions to maximise occupant protection in a frontal impact, side-on impact or rollover situation. NOTE: * LAB: the Accident Analysis, Biomechanics and Human Behaviour Laboratory of PSA Peugeot-Citroën and Renault. - To enhance the car's torsional rigidity and also reinforce the body's resistance in the case of a rollover, the bulkhead between the rear bench seat and the boot is now a one-piece, fully-welded panel which is attached more strongly to the body sides. - Also to enhance torsional stiffness, the sills have been stiffened thanks to the use of larger cross sections and the incorporation of additional strengthening and inserts. - The rear seat floor cross member has been strengthened across its full length, thanks notably to the use of angle brackets at either end. This work has helped improve protection in side-on collisions. - For optimal protection in a rollover, the A-post/windscreen pillar assembly has been reinforced and made more rigid by means of a hydro-formed 35mm-diameter, 3.5 mm-thick, very high elastic limit (VHEL) steel tube incorporated into the windscreen pillar. Further protection is provided by a thick gauge stiffener. - To prevent powertrain components from penetrating into the cabin in a head-on collision, the front structure underneath the engine has also been reinforced. - Last but not least, a double floor has been added at the front to contribute to the body's overall structural rigidity. Other systems designed to help prevent serious injury in the case of a major head-on collision are the deformable steering wheel, collapsible steering column and retractable brake pedal, plus extensive padding to help absorb impact energy. - the anti-submarining airbags located in the front seat cushions restrict forward movement and rotation of the pelvis. Along with the pretensioners, they help optimise protection against submarining, whereby the pelvis has a tendency to slide beneath the seat belt's lap strap, a phenomenon that can produce sometimes serious abdominal lesions in a collision. - dual-chamber head/thorax/groin airbags, which adjust the maximum load exerted as a function of the morphological strength of each of these three parts of the body. A specificity of this body type is the housing of the lateral airbags in the front seats. Meanwhile, the fixation rods of the new generation head restraints slide within the head restraint and no longer within the upper part of the seatback to ensure enhanced protection of the cervical vertebrae in case of impact from the rear. The rods no longer form a rigid element in the seat and this allows the occupant's back to sink up to 60 mm into the curved, frameless seatback following an impact, resulting in less movement of the head and thorax. The rear seats are equipped as standard with safe, easy-to-use two-point Isofix child seat anchorage. If a universal child seat is attached to the front passenger seat, the anti-submarining airbag is disconnected at the same time as the passenger airbag. The new Renault Megane Coupe-Cabriolet line-up includes two specifically sporty versions: Megane Coupe-Cabriolet GT Line and Megane Coupe-Cabriolet GT. New Megane Coupe-Cabriolet GT Line takes the form of a Sport Pack available for Dynamique equipment level versions powered by core-range engines. New Megane Coupe-Cabriolet GT Line combines sporty features with economical, environmentally-respectful performance. New Renault Megane Coupe-Cabriolet GT Line sports a bespoke front bumper with sculpted Dark Metal coloured recesses in which the foglamps are set. The windscreen frame and cockpit surround are also picked out in this Dark Metal colour. The rear bumper incorporates an aerodynamic diffuser, while 'GT Line' badging features on the grille and boot-lid. New Renault Megane Coupe-Cabriolet GT Line's sporty looks are rounded off by 17-inch Celsium aluminium alloy wheels. Inside, 'GT Line' badging is visible on the head restraintss and dashboard trim strip, with an aluminium pedal covers and analogue rev-counter adding further sporty touches. The Renault Sport Technologies-developed GT version packs styling cues and a level of driving enjoyment that take their inspiration from those delivered by Megane R.S. The Renault Sport-badged Renault Mgane Coup-Cabriolet GT boasts the same styling details as the GT Line version, plus specific features such as 18-inch dark metal Jetow aluminium alloy wheels and the thick-rimmed, leather-trimmed steering wheel with built-in thumb-rests developed for Megane R.S. - upgraded brakes, with 296 mm-diameter ventilated front discs and the same master cylinder as Megane R.S. Like all the Renault Group's factories, the Georges Besse plant in Douai, northern France, benefits from ISO 14001 certification. It was here that the very first Meganes were assembled in 1995 and production quality has improved contonously ever since thanks to standardisation of the work stations, specific operator training and the strengthening of inspection processes. Scenic and Grand Scenic, which are currently produced in Douai, both benefit from TOP3 quality-related rankings in their segment in Germany (source: ADAC). In 1969, the French state – then the sole shareholder of the Régie Renault as it was known at the time – decided to build a new factory in Douai in response to the crisis that was badly affecting this long-time industrial heartland. Building lasted from 1970 until 1975, and the factory began by manufacturing the Renault 5, with production starting in 1972. The first model this plant was specifically chosen to produce was the Renault 14 (from 1976), while the early 1980s were marked by the success of the Renault 9 (1982 Car of the Year) and Renault 11. From 1986, the Douai factory ensured the production of the Renault 21, before the advent of the Renault 19 – Germany's most popular imported model – corresponded with the launch of the brand's Total Quality drive in 1988. In 1993, the factory was official named after Georges Besse, the company's CEO who was assassinated in 1986. Three years later, the plant started manufacturing Megane I Hatchback and Classic, and then Scenic I (1997 Car of the Year). The unprecedented success of the latter in terms of both sales and image led to the factory being given over entirely to this model from 2000 until 2002. In 2002, production of Megane II Hatchback began, followed by the manufacture of Scenic II and Megane II Coupe-Cabriolet in 2003 and, in 2004, that of Grand Scenic. Since 2009, the production of new Scenic and New Grand Scenic – two models that have gone on to be rated among the best in their segment in Europe with regard to quality – has given the factory a chance to provide further evidence of its unique production expertise. New Renault Megane Coupe-Cabriolet is manufactured alongside Scenic and Grand Scenic on the two assembly lines at Renault's Douai factory, in France. It consequently benefits from the €250 million investment previously injected into the plant at the time of the start-up of the new Megane programme. Managing the diversity that stems from the simultaneous manufacture of the MPV and coupe/cabriolet versions is key to the production process, while a revised organisational plan has been implemented to guarantee the same outstanding results in terms of quality. In order to ensure a particularly high standard of quality from start-up, operators underwent a total of 3,400 hours' training ahead of the production of the new Megane Coupe-Cabriolet, including specific guidance covering the assembly of the roof which is a complex feature in terms not only of its geometry but also of its hydraulics and wiring. The new Renault Megane Coupe-Cabriolet is now on sale in western Europe and joins the Hatchback, Coupe, Estate, Scenic and Grand Scenic versions as the new Megane programme's sixth and final body type.